The Art of Satire, the 2018 Summer Film Festival at Phoenix Art Museum, will present a diverse range of films with characters presenting moral courage in an uncertain world to reflect on social issues facing our societies today. Sponsored by Contemporary Forum and Lisa Sette Gallery. A comedy set in the art world of contemporary London. 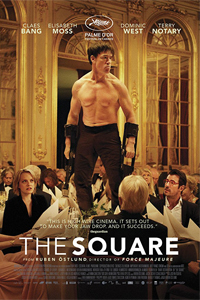 Starring Gillian Anderson and Stellan Skarsgaard, it centers around a cast of characters devouring each other in a small world awash with big money. Set against the backdrop of contemporary London and the international art scene, it casts an eye over the appetites and morality of some of its major players. 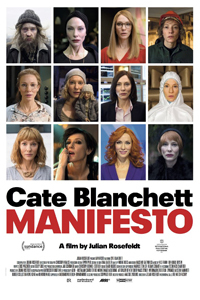 From acclaimed visual artist Julian Rosefeldt, Manifesto features Cate Blanchett in 13 distinct must-see vignettes that incorporate timeless manifestos from 20th century art movements. From anchorwoman to homeless man, from Pop Art to Dogma 95, a chameleonic Blanchett gives tour-de-force performances as she transforms herself like never before. Rosefeldt weaves together history’s most impassioned artistic statements in this stunning and contemporary call to action. 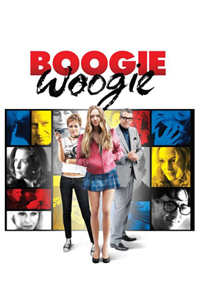 Set in artsy Chelsea, this satirical film centers on a young bohemian avant-garde composer Adrian (Adam Goldberg), who becomes involved with a trendy New York art gallery owner, Madeleine (Marley Shelton). Adrian is a composer who makes music by breaking glass and kicking metal buckets.